Once again, the FreeStyle Lite, Bayer Contour Next and Prodigy Voice top our categories for blood glucose meters, proving that reliable technology beats fancy features. But with more smartphone-compatible glucometers being released every year, we think it's only a matter of time before they take over. 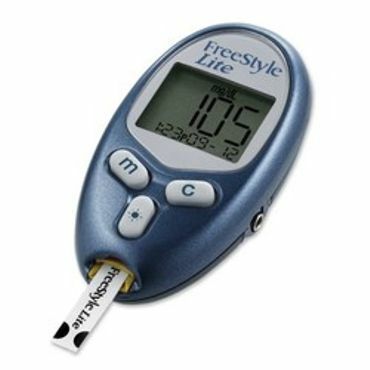 Users love the FreeStyle Lite glucometer for its tiny size, fast results, and the equally tiny 0.3 microliter blood sample it requires. Experts love it for its excellent repeatability and accuracy in clinical trials. Other user-friendly features that make this the top glucometer in our report include its backlit screen and illuminated test strip port, no-coding test strips, great durability, and a 400-reading memory that calculates a number of averages to help you spot trends in your glucose readings. 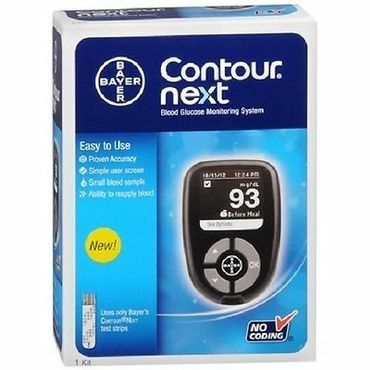 The inexpensive Bayer Contour Next excelled in a clinical trial and packs features that are very rare in this price range, including programmable reminders and the ability to add notes or meal tags to readings. Users especially love that you can apply blood to the Contour Next test strips from almost any angle, and if you don't provide the full 0.6 microliter sample on the first try, you have up to 30 seconds to add more blood to the strip. 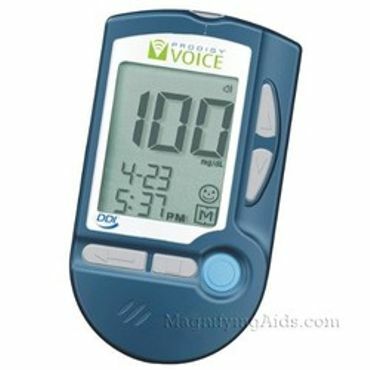 The Prodigy Voice continues its dominion over other talking glucose meters for very good reason: It's the only model we've seen that can talk you through every single aspect of its use, from setup to calibration, testing and accessing the memory function. The three high-contrast, touch-friendly buttons are located on the front of the device (no fishing around in the battery compartment), and a playback button allows you to repeat the last message or reading spoken by the meter. Basic blood glucose meters have just one job: Sampling a drop of your blood and telling you how high -- or low -- your blood glucose levels are. You use a lancing device to prick your finger, then touch the resulting drop of blood to a test strip that slides into the glucometer. Standard features include a memory function for storing past readings and the ability to average those readings over time. Some basic meters also come with software that lets you track and visualize your blood glucose trends, and a few let you program customizable alerts or flag readings for special circumstances. If you have limited or no sight, talking blood glucose meters are the key to checking your blood sugar readings independently. They use audible messages to coach you through the process of setting your meter up, testing your blood glucose levels and recording the results. The best talking glucometers also have Braille instructions, large buttons that are easy to identify by touch, and large, easy-to-read digits for reference by those who are partially sighted. Accuracy and consistency (also called repeatability) should take priority over the fancy bells and whistles you'll find on some modern glucose meters. For people with diabetes, getting the readings right -- or at least within a reasonable range -- can be a matter of life and death, or at least the ability to consistently feel good. Just because a home blood glucose meter meets the current federal standards doesn't mean it's the best. The newest standards, released by the FDA in Oct. 2016, require that 95 percent of the readings should be within plus or minus 15 percent of the laboratory control, while 99 percent of the readings should be within plus or minus 20 percent of the laboratory control. That's an improvement over the previous guidelines, but still leaves a lot of room for "acceptable" error. Even if your insurance company covers the cost of diabetic supplies, be aware that it may only cover a limited selection of brands -- so check your coverage before you buy. If you don't have insurance, you can often get a free meter and a sample batch of test strips from your doctor or even directly from the meter manufacturer. Watch out for the cost of test strips, though -- they are the greatest overall expense in your diabetic testing kit. The test strips that accompany the monitors in this report range from $20 to $45 or more per box of 50. If you test your blood sugar four times a day, that supply will last you a little less than two weeks. With more expensive brands, the cost of test strips can easily clear $1,500 per year. Certain drugs can cause errors with glucose meters that use a specific type of test-strip technology (known as GDH-PQQ), resulting in dangerous -- potentially fatal -- false readings. Always consult with your care provider if you have any questions or concerns, and check your blood glucose meter's packaging carefully, too. Finally, if you're dealing with diabetes, your doctor may direct you to check your blood pressure regularly as well. We've researched expert sources and consumer reviews to bring you a full report on the best blood pressure monitors. "Accuracy Evaluation of Five Blood Glucose Monitoring Systems Obtained from the Pharmacy: A European Multicenter Study with 453 Subjects"
"Accuracy Evaluation of Blood Glucose Monitoring Systems in Children on Overnight Closed-Loop Control"
We consulted a number of clinical trials and expert evaluations to determine accuracy, ease of use and convenience for the glucometers in our report. Aside from medical journals, our analysis included hands-on reviews from sources like Consumer Reports, Healthline, HealthCentral and diaTribe. We also relied heavily on sources like the National Federation of the Blind, the American Foundation for the Blind and DLife.com to find the best talking blood glucose meters. Finally, we also scoured retail sites like Amazon, Walmart and Walgreens for user input on how these blood glucose meters perform in the real world. After all, accuracy in controlled clinical trials is one thing, but even the best medical trials can't always simulate all the challenges of real-world conditions or, in some cases, simply figuring out how to use the meter.